New take on the Sobell guitar design? When I opened my own shop over ten years ago the work I made was very much like what I’d been doing for Stefan Sobell. Of course it was, up until 2009 all my work was based on the Sobell guitar design. But around that time I started making cylinder top instruments based on the old Howe Orme design. I’ve made a lot of cylinder top instruments since then. It’s an interesting design, different from the Sobell guitar design. But does share some similar aims. Then last year I came up with the Session King, a heavy body with a strong, light, flat soundboard. Despite its looks the guitar features some very modern materials. It features several design ideas to make a loud, strong and responsive instrument. This (for me at least) was a new way to work, and went on to inform my more expensive cylinder top work. So now most all work is based around the “light top/heavy body” idea. It’s been a good 13 years since I’ve made a Sobell guitar. And about 5 years since I’ve made the “Forster” version of it. To be honest, I don’t want or need to go back and make a Sobell style guitar to see where the work is now. Now what I’m interested in is applying the stuff I’ve learned in recent years to that Sobell guitar design to come up with something new. 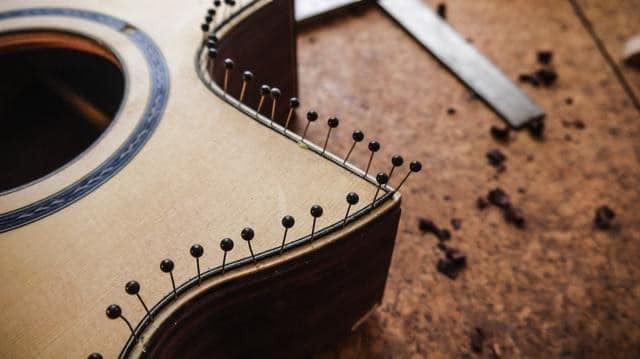 So what is so special about Sobell guitars? Is it the wood? Is it the special wood? Is it the special rosewood? The maple? The spruce? Is it magic? Well, you could argue that it’s a lot of things, and that those things combine make that famous sound. I’m more than familiar with the building process Stefan used whilst I was there. So I’m very familiar with what those factors may be. Many of them are still present in my work today. But the one which interests me most, is the soundboard shape. 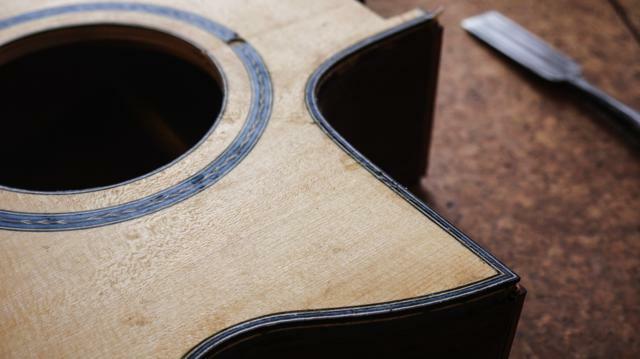 When I say soundboard shape, I don’t mean the outline of the guitar, though that does play some role. 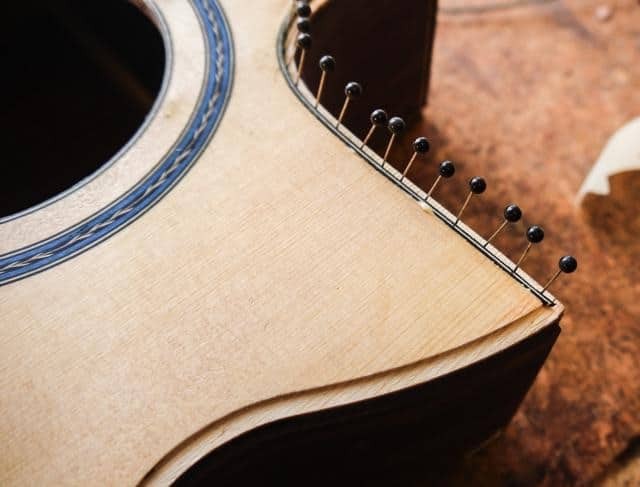 No, what I mean is the three dimensional shape – the “topography.” To me, this is the most important factor in shaping the “voice” of any guitar. It’s the most unusual aspect of the Sobell design. – Not the “stress free construction” or the heavily curved back. Nor the careful material selection, nor the bracing pattern. Nor the high temperature/low humidity conditions in which it’s assembled? No, my feeling is (as Torres is quoted as saying) “The top is the guitar”. 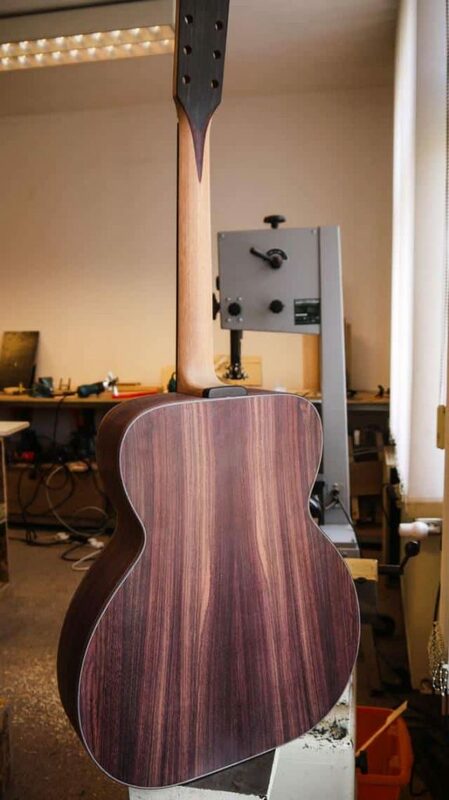 When I worked for Stefan, every guitar we made used the same top former. Sure we played around with thicknessing and bracing, but we didn’t experiment at all with the “topography.” That said, over the years the former itself changed. – Years of clamping and over clamping caused the former to deform in certain areas. This added to the shape’s complexity. 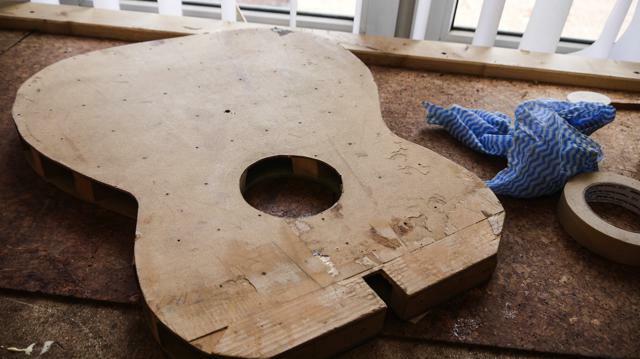 When I opened my own shop, the first thing I did was make my own top former, based on the Sobell guitar design. 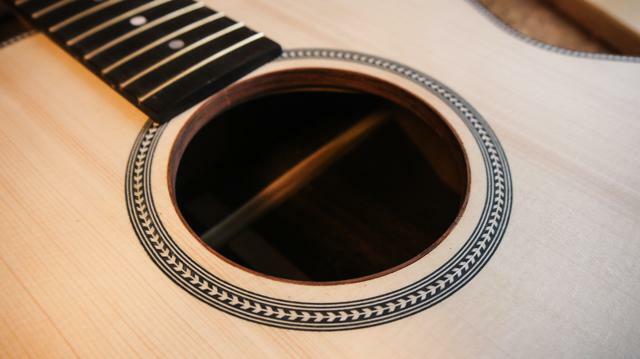 – The only thing I changed was the upper are above the sound hole to “set” the neck angle and to ease fretboard fitting. I used that “Sobell” former for every guitar from 2005 up until 2009. Then I started making a few cylinder top instruments. Within a year or so I stopped using the “Sobell” former, and made cylinder top guitars. That “Sobell” style top former of mine hasn’t been used for a good 5 years. So this year I’ve dusted it off and used it again. Well, I love the guitars I’m making now, they are loud and responsive, balanced and powerful. This could down to the heavy sides and light soundboards. And to a very efficient bracing system I use now. There have been a lot of changes. What’s might be what the results if I apply my recent ideas to a guitar with a soundboard made in the style which I’m very familiar with? – Using the “Sobell” style top former. I’m making a pair of Model C guitars. Both using materials that are also very familiar to me: Indian rosewood back and sides and European spruce soundboards. One with herringbone and is heading for Scotland when finished. It features a very light spruce top I bought from Italy about 10 years ago. And some very old and Indian rosewood I bought from a dealer in Germany in 2008 that he’d had since the 80s. The other (the cutaway) is for Dream Guitars in North Carolina. For that one, I’m recycling a soundboard I made years ago. It’s a nice looking European spruce top, circa 2002/2003. In it is a “crow’s foot” and dyed blue birds-eye maple line rosettes from around 2006 or 2007. This top was wide enough to make a Model J. But I don’t make that model anymore. So it never got used, but now seems a good time to use it. I’ve not used that blue veneer for years and I really like the look of it. Expect to see more blue maple, and the old fashioned herringbone this year. The herringbone Model C is for a chap in Scotland who got into my work after he tried an older Model C of mine made with that original soundboard former, so I thought he’d really like this updated version. 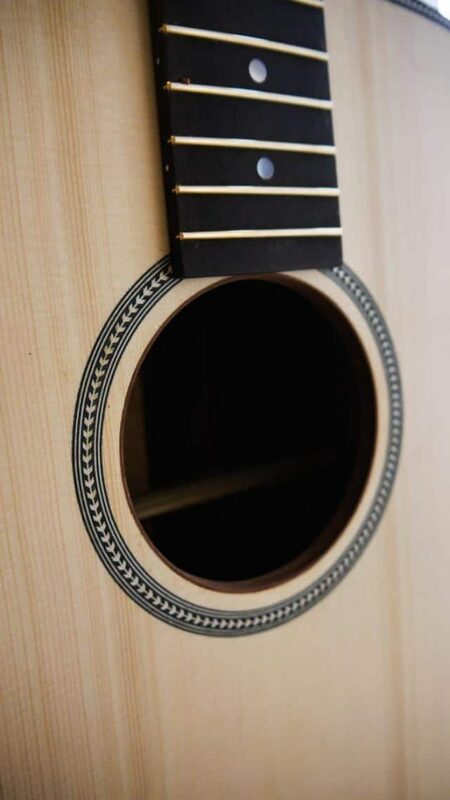 The head veneers are laminated with Indian rosewood and ebony. 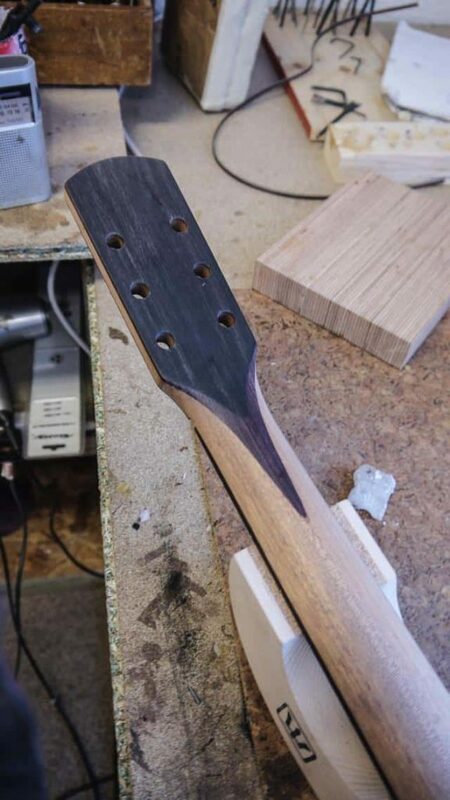 So, the soundboard “topography” will be the same as I was doing all those years ago, it’s based on that old Sobell guitar design, the materials are the same, the “look” is familiar. But the bracing, the thicknessing and the modern construction are different. Very different. So what results am I hoping for? Well, I would expect the basic sound to be very familiar, all the clarity and power you’d associate not just with Sobell guitars but with Forster guitars too. But basically, honestly, I’m expecting more of it.